One Uptown resident, Patricia Morris, said that the mayor’s “budgeting for outcomes” process is poorly named, given its focus on problems — such as filling potholes — rather than solutions, such as passable streets. The Department of Public Works is developing a long-term plan to fix interior streets, Landrieu replied, but it won’t be quick. In the meantime, filling potholes is the only way to keep the roads passable, Landrieu said, and his administration has filled more than 50,000 of them. Hand-in-hand with the complaints about roads were comments about streetlights that are out, and Landrieu reiterated his administration’s pledge to have every streetlight working by the end of the year. Another consistent theme through the evening was the ongoing fight against blight. Several residents complained that it is too hard to get long-neglected buildings in their neighborhood back into commerce, while others said that too many buildings are being torn down, while empty lots are growing into jungles. Patricia Gay of the Preservation Resource Center urged the mayor to plan for sustainability by protecting the city’s “built environment,” and joined several others in urging him not to understaff important entities such as the City Planning Commission, the Historic District Landmarks Commission and the Department of Safety and Permits that have direct bearing on development in the city. “Blight is at the top of everybody’s list because it touches so many things,” Landrieu agreed. Landrieu said his administration’s redesign of the city’s blight eradication efforts have resulted in about 4,500 properties being taken down, well on the path to reaching his goal of 10,000 by the end of his four-year term. But that’s still only a fraction of the estimated 45,000 blighted properties around the city, he said, and no number is really satisfactory to residents who still live next to them. Meanwhile, the city continues to inherit these empty lots, and is spending massive sums of taxpayer money to try to keep them mowed. A program suggested by one resident Monday night — to hire young people to cut the lots in their neighborhood — is already being tried in the Ninth Ward, Landrieu said, and he hopes to expand it citywide. Landrieu’s repeated mention of firefighters was no accident. Firefighters and their supporters have begun a pre-emptive strike against what they believe to be major upcoming cuts to the fire budget, and were handing out yellow flyers before the meeting exhorting residents to support them. Firefighters Association president Nick Felton noted that some of the companies that responded to a fire on St. Charles that very afternoon are slated for cuts, and a handful of residents asked when the fire station on Louisiana Avenue would be reopened. One speaker noted that a reduction in fire service could even exacerbate homelessness in New Orleans, as residents who lose their homes are left with nowhere to live. Those comments were among the first Landrieu addressed, and he did so at length. He began by saying that local governments around the nation are going bankrupt — not New Orleans, he pointed out — and those that aren’t are laying off first responders and teachers. Second, Landrieu said that because his budget hasn’t been released, he hasn’t actually proposed any cuts — though the fire department is $1.1 million over its own budget for the current year. Finally, Landrieu said, governmental employee pensions are another issue of nationwide concern, and the major issue underlying the fire budget is that the city of New Orleans is embroiled in a fight with the fire department over what the city owes the firefighters’ pension. Though he regards them as heroes, Landrieu said, money spent on their pension is money not spent on other city priorities. 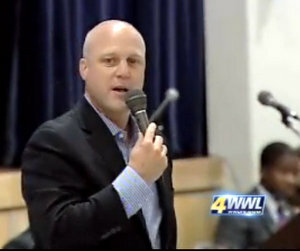 Regarding the station on Louisiana Avenue, Landrieu said he hasn’t yet studied how many stations the city now needs, whether that number is higher or lower than before Hurricane Katrina. A number of residents decried what they saw as a lack of progress in Gert Town. Xavier University is rapidly expanding, they said, but little else is improving in the community. Pointing first at the rebuilt Earhart corridor, Landrieu then rattled off other projects on the edge of Gert Town, such as the Blue Plate Artists Lofts and the removal of blighted buildings in the area. He suggested, however, that more could be done if not for infighting between community nonprofits. Looming increases to the Sewerage and Water Board rates — on the heels of increases to garbage fees and property taxes — were another topic mentioned several times. Landrieu, the president of the board, painted a picture of a major city system on the verge of possible collapse without a major intervention. “One of the things all of you know is that this is an old, tired city,” Landrieu said. Leaky before Hurricane Katrina and worse afterward, the city’s ancient water lines lose about 40 percent of the water that courses through them, Landrieu said, and the city is still in negotiations with FEMA for money to begin replacing whole lines rather than patching individual holes. Meanwhile, however, the power system has been heavily stressed, and the board’s bond rating is in danger of falling. Some sort of rate increase, he said, is going to be mandatory soon to stave off these problems before they get even worse. Another rate hike that drew repeated mention Monday night was the ongoing process of property tax reassessments, with residents complaining bitterly about the seemingly unending leaps in assessments, followed by all-day waits and high personal costs to challenge the new numbers. Landrieu largely sidestepped the issue, noting that Assessor Erroll Williams doesn’t work for him, but that he is attempting to fix inequities caused by years of separate assessors. Notable for its omission was the lack of any strong call for more police on the street, and Landrieu certainly didn’t offer any. Only one speaker mentioned the city’s highest-in-the-nation murder rate, and the only real request for more resources for the New Orleans Police Department was from a handful of Central City residents asking that the crime cameras be reactivated in the NOPD Sixth District. Unlike private security cameras in people’s homes or businesses, which can capture footage that is highly useful to police and prosecutors, public crime cameras have very limited effectiveness, Landrieu said. He’s not against the idea of reactivating some, but for now he believes the money would be better spent elsewhere. After the federal consent decree over the NOPD, the city is now trying to determine how much money it will have to spend on a consent decree being negotiated with the sheriff’s office. Landrieu attacked Gov. Bobby Jindal and the state legislature for their refusal to raise any state revenue to help with the national recession, even the cigarette tax, which if raised from 35 cents to the national average of $1.10 could generate massive amounts of money to help with mental-health funding. Landrieu also noted that Charity Hospital, a “beautiful, beautiful building,” needs a new use, and suggested it as a new home for City Hall. He said he supports the speed cameras because most are placed in locations where residents have complained about speeding, and they let police officers focus on more important issues. The camera he hates most, he said, is the red-light camera at St. Charles and Washington: “Make sure you stop there before you take a right,” he warned, to laughter. He also used a comment about garbage- and utility-fee scofflaws to make what may have been a veiled reference to his administration’s controversial permit enforcement sweeps. “If someone doesn’t pay, how many people think we ought to turn their water off?” he asked, and only a few hands were raised. “If someone’s running a business and they don’t pay their taxes, how many people think we ought to shut them down?” Many more hands shot up, and Landrieu nodded his agreement. A few suggestions by neighborhood activists on how to save money weren’t addressed directly, however. One of the very first speakers, Nell Carmichael of the Bouligny Improvement Association, suggested cuts to the perks for city employees such as cell phones and take-home cars, as well as to the public-relations department. Tim Garrett of the State Street Drive neighborhood suggested that fewer tax and fee exemptions be allowed for nonprofits, schools and large entities such as the Audubon Institute: “I’d rather see them double the number of ratepayers than double our rates,” he said of the Sewerage and Water Board. If residents’ questions and the mayor’s responses were the main act Monday night, there was a significant sideshow about halfway through it. 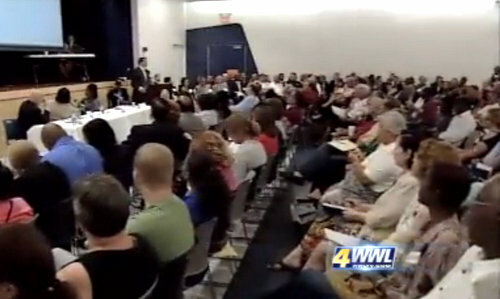 Well-known local-government critic Sandra Hester began her comment by telling the moderator that he might as well put away his timepiece, because she had no intention of stopping after two minutes, and Landrieu then intervened to tell the audience that they were in charge of stopping Hester when they wanted. The audience began shouting at Hester, and she called them racists, mocking the moderator when he tried to intervene and then handing him the microphone derisively, noting that her powerful voice could fill the auditorium unamplified. After several minutes of an escalating shouting match between her and the audience, she was surrounded by police officers, and the meeting attempted to resume with speakers allowed to ask questions into the microphone over Hester’s discussion with police. About three people spoke as the disturbance around Hester’s seat continued, until she finally cried out that she wasn’t afraid of the officers’ handcuffs. “I’m not afraid of jail. They’ve been better people in jail than me,” Hester yelled, as she was led away and the audience broke into applause. Great coverage of the meeting. Much better than the Times-Picayune. What J said. Even your description of the Hester sideshow is more accurate than what the T-P ran this morning. One thing not mentioned here but the Mayor did say is that monthly/quarterly spending on expenses is occuring in departments. It’s a no brainer to do this as an aid for budgeting purposes. The OIG report issued a while back pointed this out as a huge deficency for years that I have never understood the mayor’s office/city council didn’t seem to do. The “Budgeting for Outcomes” is a nifty phrase, but if the money isn’t there after taxes are collected it’s a constant hole/deficit. Another factoid mentioned is the estimated amount for the lawsuit payout to the mother of the kid killed in his p’j.s by NOPD in a bad drug bust = about half the estimated cost of the DOJ Consent Decree, $6 to $8 million…..
Great job of actually reporting on the issues discussed at the meeting. Now hopefully Mayor Landrieu will use the input he received in making his decision on the budget. So, what happened to Diana “The Banjo” Bajoie, who was supposed to attend? Was she a “no show”? What did she and “Half Moon” have to say about the Banjo’s participation in “con-profits” and the the Banjo’s feathering the nests of Family members and political insiders to the tune of HUNDREDS of THOUSANDS of taxpayer dollars? And did the Banjo address the likelihood that she she will be indicted by “Lettenemgo”? Just wondering. Ashton O’Dwyer. I have been working for over a year to get the old Louisiana ArtWorks building on Howard Avenue back into commerce with hybrid restaurant, retail, business, motion picture, television, new media and an education incubator for the film/TV industry. Nothing but stonewalling by old Arts Council guard who failed miserably at this boondoggle. It’s time for them to take their medicine and get out of the way. I am offering a solution to a $600,000/year debt New Orleans must pay U.S. Housing and Urban Development, and can turn this abandoned asset around in 12 months. Any profit would go back into the city’s budget. Yes. The city would actually see a return for their money. Yet, they stonewall and obfuscate at every chance. So, it doesn’t matter about blighted property, abandoned assets, etc. It’s about recalcitrant old school bagheads who won’t step away and will do anything to hinder progress. That’s why New Orleans sits as it does today. Thank you Robert Morris for a much better rendition of the news that matters to us than the local paper. I’ll be supporting this news venue. And, using my full name to say so. Much as one might take issue with Ms. Hester’s style of comments, it is a shameful state of affairs that Mayor Landrieu would inflame the contention with Ms. Hester. Indeed, it appears that she didn’t even receive the opportunity of courtesy afforded to other speakers to present comment uninterrupted, before her two minutes expired.